Conservation partnerships between protected lands and their non-protected neighbors could significantly improve a region's ability to accommodate species migration in response to shifting climates, according to a study published February 28, 2018 in the open-access journal PLOS ONE by William Monahan of the U.S. National Park Service and David Theobald of Conservation Science Partners, Inc., U.S.
Around the world, climate change is forcing species to move beyond their comfort zones, such as by migrating to higher latitudes or elevations. This poses challenges for managing land set aside for habitat protection, which may lose its original conservation value as climates shift. Partnerships between protected areas and non-protected neighbors could help, but the potential benefits have remained unclear. To quantify the potential value of conservation partnerships on a global scale, the authors analyzed protected areas recognized by the United Nations Environmental Programme and the International Union for Conservation of Nature. The analysis included all protected areas larger than 6 hectares in size, for a total of 157,062 areas. Following core tenets of conservation biology, the authors examined landscape indicators of the suitability of each protected area to retain biodiversity in the face of climate change, either in isolation or in potential partnership with nearby protected and non-protected lands. Indicators of suitability included range in latitude and elevation, as well as the increase in size needed to ensure species' continued access to suitable climates in 2070 as conditions shift. Their analysis produced numerical 'adaptation indicators' for each area. 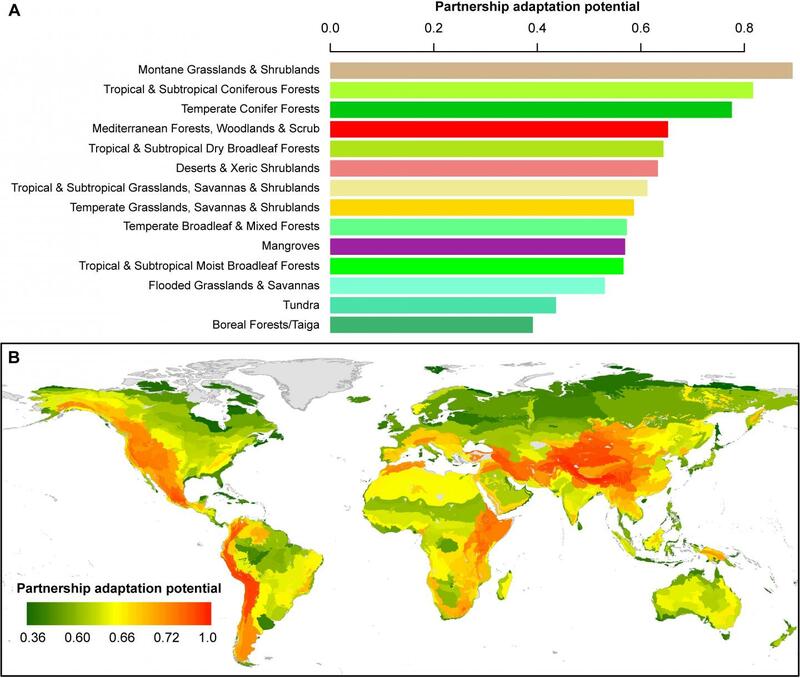 The authors found that, compared to isolated protected areas, partnerships with other protected and non-protected neighbors could increase the adaptation indicators by up to two orders of magnitude, suggesting significant potential for preserving the environmental conditions that sustain biodiversity. Further analysis highlighted specific biomes and regions that could benefit most from partnerships between protected and non-protected areas. These included montane grasslands and shrublands, tropical and subtropical coniferous forests, the Andes, the northern Arabian Peninsula, and the Sierra Nevada Mountains of California. "The partnership areas identified by our study are considerably larger than most protected areas, but a handful of established conservation partnerships – tried and tested over many years – have proven that success is possible," said William Monahan. "By quantifying the conservation benefits of such partnerships, and providing a global blueprint of where they exist, we hope to stimulate the formation of new partnerships that help steward a future for biodiversity conservation." Funding: This work was supported by the NASA Applied Sciences program through award number 10-BIOCLIM10-0034. The funders had no role in study design, data collection and analysis, decision to publish, or preparation of the manuscript.